Alessandro Fantini was born in 1978 in Sangro Valley, Italy. His creative inclination arose during his early childhood when he began drawing comics and writing tales influenced by gothic authors like Poe and Le Fanu. During the nineties he developed his own visionary style blending the surrealist attitude with hyperrealism and Flemish painting methods. Since 1998 he wrote, directed and produced movies and music videos digitally, composing also their soundtracks and writing lyrics for songs performed by himself. His short movies "Tiranti Transit" and "The road to Shakti" were broadcasted in 2006 and 2007 on European Sky Channels. He wrote and illustrated the book "The Night's Veil"(2006) and the dark-fantasy novel "Endometria"(2007) both published by Liberodiscrivere and presented at the International Turin book fair.His self-portrait was published in 2004 inside the Jean Michel Jarre's "Aero" album booklet. His artworks have been shown in several group exhibitions and solo exhibitions in Pescara, Turin and at the London Brick Lane Gallery. 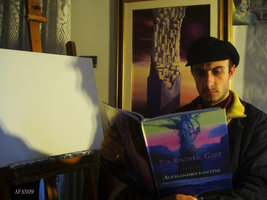 In 2008 he released his first art book "The Sinovial Gaze - The art of Alessandro Fantini".